Crafted of hand-selected calfskin for a premium look and feel. 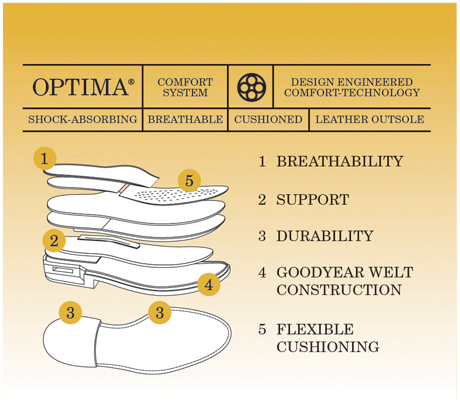 Exclusive Optima® Comfort System with multi-layered cushioning is engineered for optimal comfort, support and flexibility. Leather lining with perforated for forefoot enhances breathability. Leather sole and combination stacked leather/fineline rubber heel for a clean, dressy appearance. Goodyear welt construction allows leather to mold to your foot for a truly individual fit. I spend most my day and work boots and sneakers. I have had my dress shoes for 20+ years! It was time for a new pair and I didn't want to go to a warehouse-type shoe store. Was treated well at my local Johnson & Murphy store. I was sized correctly and found a great dress shoe. Great shoe. I've been wearing them for over 15 years for work, church and dress occasions. For an all leather shoe it is comfortable, but your feet do fatigue if standing for hours. They are a good value even at the high price. I always really enjoy shopping at "Johnstonmurphy"
Yes,I would buy this shoe again. Beautiful shoe. However, I could not find the right fit. Beautiful shoe. However, I could not find the right fit and I tried almost every width in my foot length. I may need custom made shoes. My heel is narrow while my toes need extra room. I have a pair of these in tan. I usually get size 11 EEE or 11.5EEE. After tying those I went for size 10.5 EEE. They fit alright ( still not great) but slip a little in the back. I got the same size on black, and they fit completely different. They are to narrow in the toe, and too wide in the middle and back of the shoe. This leaves me with a shoe that pinches my toes, wrinkles, because it is too wide in the middle, and slips in the back. I tried a smaller size not width, and it still slipped. The problem is that it is too wide in the back and too narrow in the toe. I am at a loss as to what size to get.